There is a clear exchange of power that is happening right now in the Sacramento real estate market. It’s as if the king of the market (cash) has announced his abdication, and one of the heirs (FHA) has quickly begun a quest to rule the throne. As cash investors have been leaving the market, FHA buyers have been picking up their slack. Of course, conventional buyers are also co-heirs to the market throne so to speak, so we cannot forget about them. Let’s look more closely below. Feel free to use these images in your newsletter, blog or social media (just give me a link back). Dueling for Market Power: Maybe I’m some sort of data geek, but the graph above is exciting since it shows that cash and FHA are heading to cross paths soon. In fact, it looks like they’ll meet up in one more quarter or so as long as the current pace continues. 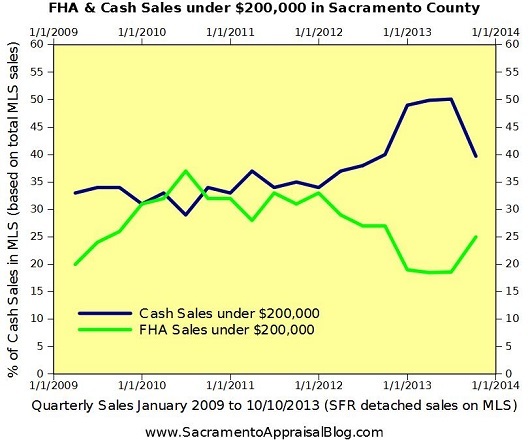 As I mentioned yesterday, cash sales have declined 12.5% since the beginning of the year in Sacramento County, while FHA has increased 3.3% in the past few months alone (or 6.4% under $200,000). Ultimately this means investors in 2014 will presumably play less of a role in shaping the direction of value and the market. Things are a-changing. Here is a video to unpack the Sacramento market. It’s only two minutes long. Enjoy and share (click HERE if you don’t see the video in your email subscription). Need to brush up on your FHA knowledge? If you’re feeling a little rusty about understanding FHA appraisal standards, it’s time to brush up on your knowledge so you are ready for the emerging market. You can check out other FHA appraisal articles I’ve written or feel free to ask questions. Also, I am sitting on a “Lunch and Learn” panel on 10/16/2013 at the Sacramento Association of Realtors called: Zombies, Vampires & FHA (you should only be afraid of two of these). Come on out and freshen up your skills. Question: What do you think your clients would say about the graphs? I’d love to hear your take. You have one of the best real estate blogs around. Keep up the good work! Thank you Drew. That made my day. I appreciate the kind words. I plan to keep on at it. Have a wonderful day! !